The Aurin Girls’ Choir compete mostly in youth choir competitions, in which the age limit is 19 years. The members of this girls’ choir are between the ages of 14 to 19; a few of them are 20 or 21 years old. Sooner or later all good things come to an end, so we had to stop singing in the girls’ choir. After a couple of years we started to miss this singing community which had given us so much experience, success and joy. This feeling was so strong that we decided to establish a new choir. We convened the old members, asked our conductor, László Durányik to direct us, and in 2006 we founded a new choir: the Aurin Female Choir. Most of the founder members had missed out on singing for a few years, but some who had joined the Aurin Girls’ Choir later, had just finished high school. Originally we just wanted to sing together without any competitions or responsibilities, but our thirst for music couldn’t be quenched; we missed the feelings that we had enjoyed years before. At the same time we felt we needed more aims and challenges; we needed a purpose for being together. 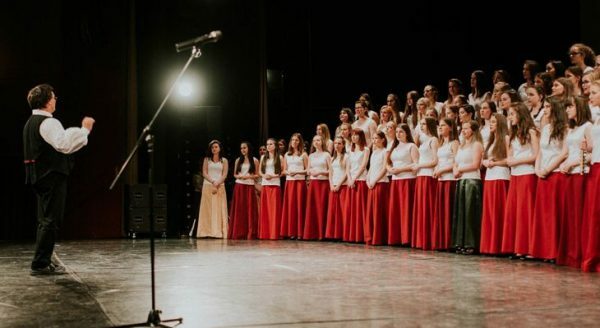 After the first year together we realized that we had made more progress than we ever expected, and we soon approached the level of the Miraculum Childrens’ Choir and Aurin Girls’ Choir. Our first contest was in October 2007 (one year after the choir was established). It was the III. International Choir Competition in Warsaw. With an outstanding performance, we were awarded the first prize. In 2008, we participated in our second International Competition in Cantonigros, Spain. In the female choirs’ category we were awarded second prize; in the folklore category we won third prize. In 2009 we won two choir competitions in the female category in Budapest; the XII. International Choir Competition and the V. Zoltán Kodály Hungarian Choir Competition.